Robinson Crusoe by Daniel Defoe, Chapter XVI: If this isn’t Hollywood action-flick material, I don’t know what is. Crusoe and Friday attack twenty-one cannibals in a desperate attempt to save two captives from being murdered and eaten, and then one of the captives turns out to be Friday’s father. It doesn’t get any better than that. The Histories of Herodotus, Book VI: So we finally have reached the events of the Persian Wars, which are the point of the whole thing. It’s remarkable how the account of Marathon only takes up about a page of this work, when it’s such an important event in the Western historical consciousness. 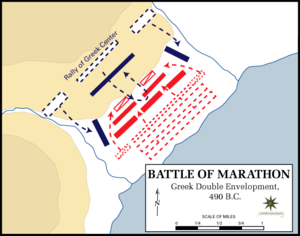 Poor Miltiades, squandering his status as the hero of the battle by using Athens’s resources in a personal vendetta. There’s a lesson here for every politician. “Of Discourse” by Francis Bacon: Every time we come back to Bacon, I’m struck by his ability to pack so much food for thought into one or two pages. I seriously am going to use this essay to try to make myself a better conversationalist. Federalist #41: This is a pretty good one. Madison effectively appeals to history to show the dangers of political fragmentation in a world of large, aggressive states. I think all members of Congress and the president should be required to read the part about enumerated powers. The Elements of Euclid, Book XIII: Euclid certainly went out with a bang, giving it to us with both barrels. This book was about as hard as Book X. My head exploded when I got to Proposition XVI. This is a work I will certainly have to revisit in the future (sometime after 2017), because I know there is still a lot more for me to learn from it. Symposium by Plato: I pity the postmodernist asked for an opinion on this work. A positive reaction elicits charges of misogyny, and a negative one elicits charges of homophobia. If anything redeems this dialogue, it is Socrates’s customary insistence on going beyond the physical, something that allows him to resist Alcibiades’s attempted seduction of him. By a curious coincidence, just before reading this work, my wife and I watched a rerun of Bones in which the lead character made a reference to the myth here cited of primitive man having two faces, four arms, and four legs. To give you an idea of the disarray of my home library, it was only recently that I realized I have nice Folio Society editions of Herodotus and Francis Bacon in addition to the one of Robinson Crusoe I’ve been reading from. All this time I could have been having a true bibliophile’s experience instead of dealing with the GBWW‘s Bible-thin pages. Well, there’s always this week! This entry was posted in Books, Liberal Arts and tagged Daniel Defoe, Euclid, Federalist Papers, Francis Bacon, Great Books, Herodotus, Plato. Bookmark the permalink.